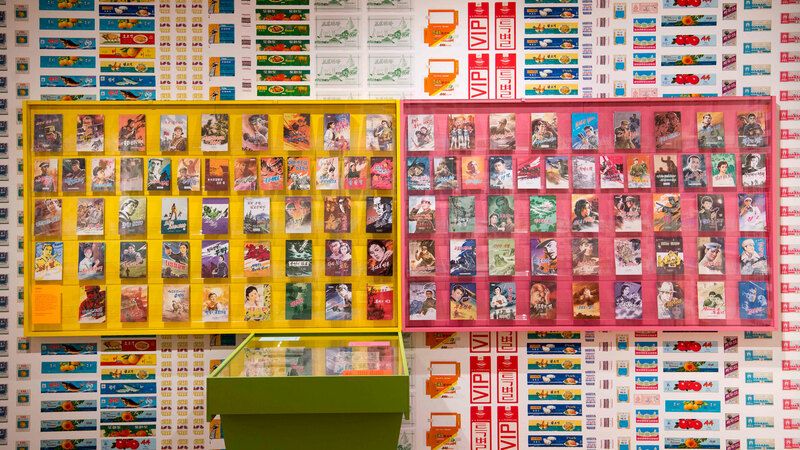 Made in North Korea: Graphics from Everyday Life in the DPRK is a new show on at London’s House of Illustration that looks to show the regularity of people’s lives in the controversial nation, from going to the theatre to smoking cigarettes. North Korea, unsurprisingly, is not known for its graphic design. Best associated with its strict and totalitarian political regime under leader Kim Jong-un, and its threats of nuclear war, it is not a country seen to be at the forefront of typography and visual communication. But a new exhibition at London’s House of Illustration hopes to change this preconception. Based on Nicholas Bonner’s book Made in North Korea: Graphics from Everyday Life in the DPRK, which was published last year, the new show is dedicated to the country’s graphics, illustrations, photography, packaging and more, and aims to provide a “window” into everyday life in “one of the world’s most controversial nations”, says Colin McKenzie, director at the House of Illustration. 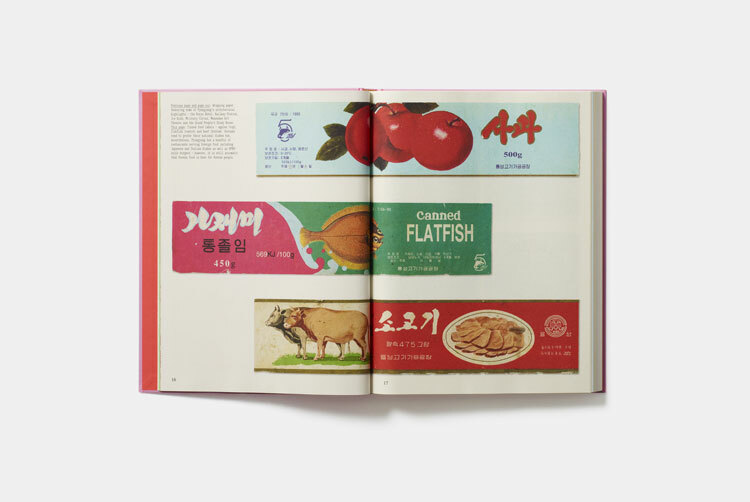 It has been co-curated by the House of Illustration’s Olivia Ahmad and Bonner himself, and includes over 100 items from his personal collection of objects, which he has hoarded following multiple trips to North Korea over the last 20 years. Spread over three rooms, the show will include everything from food packaging, ticket stubs and stamps to hand-painted posters and comics. The point of the show, says Ahmad, is not to portray North Korea as a politically-driven, propaganda machine, as it is so often perceived in the press, but to offer a new perspective by looking at everyday life there, from people’s smoking habits through to their love for the theatre or graphic novels. Such recurring motifs include magnolias, North Korea’s national flower, and the Chollima winged horse, which is a statue in the country’s capital Pyongyang. 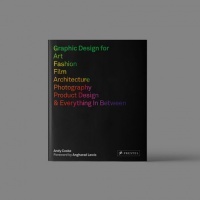 This subtle link to patriotism is not surprising, given that much of the country’s design output is created by the Government’s in-house design studio, with Bonner telling Design Week at the time of his book’s publication that “everything in North Korea is state-owned”. However, one particularly interesting takeaway from the show, is not the reminiscence of Korean culture, but actually of others. The graphic design shows similarities with that of other, past regimes in the world; there are “cross-cultural influences” that weave throughout, says Ahmad. For instance, the optimistic, happy and colourful portrayals of everyday life found on posters and greeting cards borrow directly from the propaganda posters of Communist Russia in the early 20th century – a design and art style known as “socialist realism”. 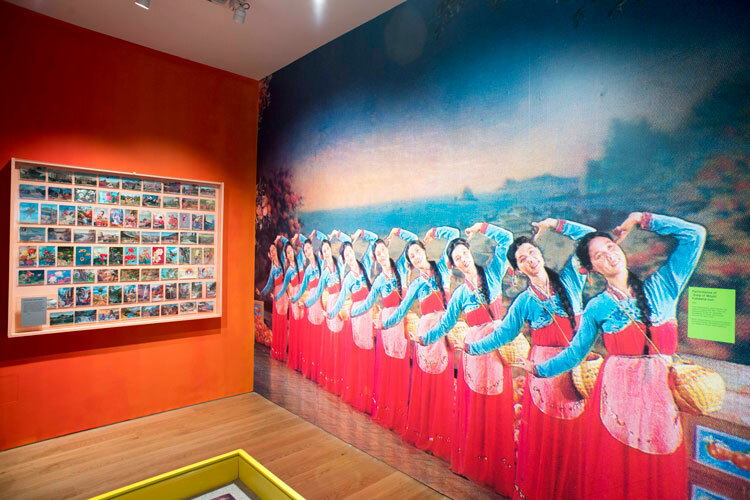 Additionally, the mundanity of some of the objects in the exhibition brings North Korea closer to other current nations. 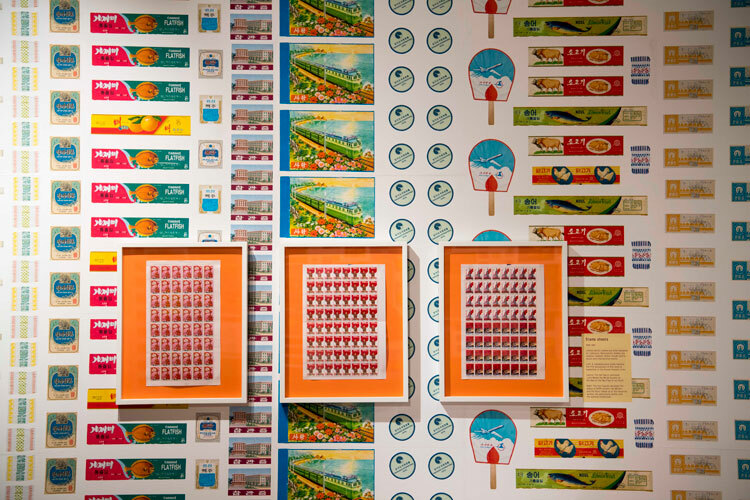 Politically, it may be far removed from the UK with far fewer citizens’ rights, but the ephemera of cigarette and sweet packaging, airline tickets and tins of tuna represents an “alternative view” of North Korea that normalises the nation and “breaks the stereotype”, says Fraser Muggeridge, founder at Fraser Muggeridge Studio, which is completing the exhibition design for the show. But there are some notable differences, adds Ahmad. North Korean advertising and branding has a “striking directness and clarity” to it, getting straight to the point of what it is trying to sell without the emotive branding strategies that can be seen on British products. The exhibition is spread across three rooms and split thematically based broadly on craft; everyday things, such as packaging and branded products; and photography. More specifically, there are sections within these rooms for different types of materials, including hand-painted posters, which represent the country’s manufacturing and farming industries, branding, identity and packaging projects, over 100 comics and illustrated books, and photographic material. The end of the exhibition is marked with a film called “Enter Pyongyang”, which explores life in North Korea’s capital city. Muggeridge says that the “general rule” when designing the exhibition was to have “no white space or calm” on the walls, and avoid the use of black and white typography. “The graphic design of North Korea is quite colourful, so every area of the show had to have colour in it, while being legible,” he says. 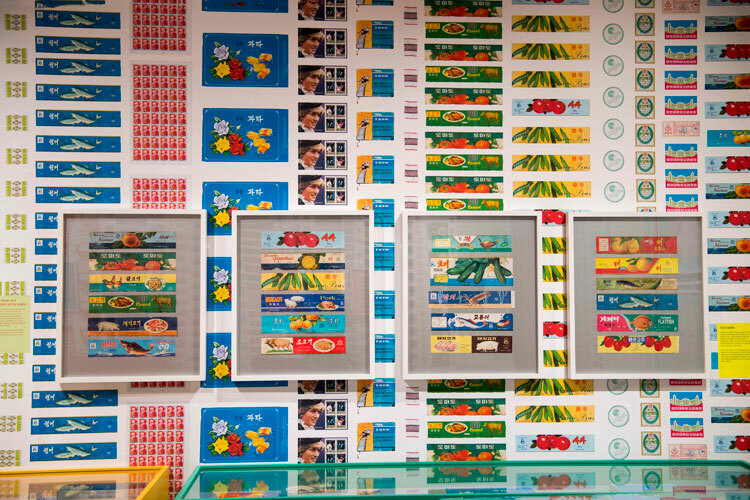 The biggest room, which is devoted to everyday items, features a “patterned wallpaper” style design, with specific North Korean packaging and branding designs printed multiple times all over the walls, such as a tin of spam. The actual exhibits are then framed and “layered” on top, to create a cluttered and “impactful” effect, says Muggeridge. The other rooms feature big, blown-up versions of an illustrated, hand-painted poster and a photograph on the walls, again among the exhibits themselves. The typography used for wayfinding and signage has been inspired by the style of the Korean alphabet, with short ascenders and descenders on the letters, adds Muggeridge. 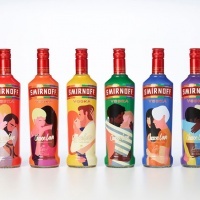 There will be over 100 items in the show, with the majority created between 1975 and the mid-2000s, with some more contemporary designs that aim to show the contrast between the past and present, as a result of more digital rendering in recent years. Visitors will also have the chance to buy replica posters on their way out. And while the exhibition purposefully avoids being political – there is no imagery of nuclear weapons for instance, says Muggeridge – visitors may still be shocked and surprised after seeing it for two reasons; firstly, because this is the first show ever dedicated to North Korean design in the UK, and secondly, because of how similar some of these graphics may be to ones people have seen countless times before. All images © Paul Grover. 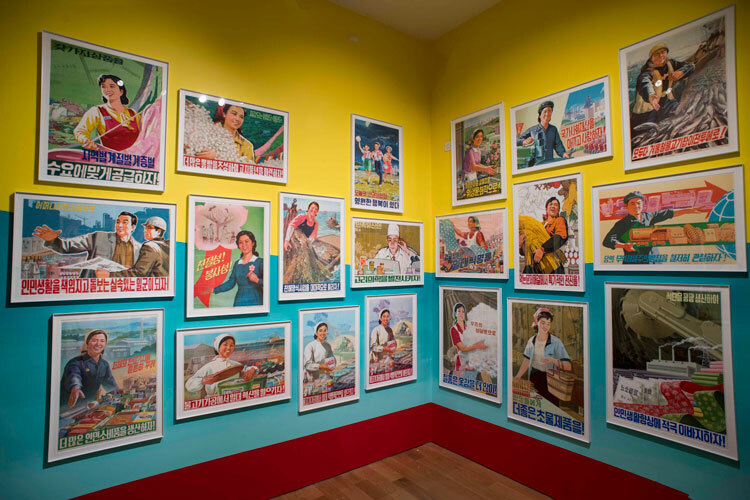 Made in North: Korea Everyday Graphics from the DPRK runs until 13 May 2018 at the House of Illustration, 2 Granary Square, King’s Cross, London N1C 4BH. Tickets cost £7.50 for adults, £5 for concessions and £4 for children. 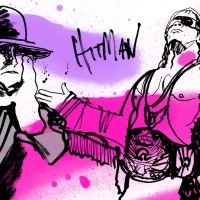 For more info, head to the House of Illustration’s site. Controversial is not the correct term for tyranny. Why would you want to normalise our perception of the country? I presume the curators wouldn’t want to normalise the every day life in Soviet Russia, Maoist China or Nazi Germany? The later would have huge uproar if there was an exhibition of Nazi memorabilia, there may be a beauty to socialist realism but there is also an aesthetic to Albert Speer’s architecture and Hugo Boss’ uniforms that we would rightly not accept to be admired in a gallery. Thanks for your comment – my apologies, we paraphrased a little too curtly on that point and have adjusted it to better emphasise what Olivia Ahmad was trying to get across – that, rather than ‘normalising’ North Korea, the exhibition looks to offer a new perspective on the country and demonstrate everyday life there.